In Chhattisgarh, January 28, Rahul Gandhi said if elected to power in May, Congress would roll out a minimum income guarantee (MIG) for every poor Indian. He didn’t spell out details, but if implemented, this is likely to be the world’s largest social safety net. Three questions: Does India need such a scheme? Can we afford it? Will the poor actually receive benefits intended for them? Short answers: yes, yes and maybe. One, contrary to smart-set chatter, India’s farms are in acute distress. From 29% of GDP in 1992-93, farm income has halved to 15% today, while the share of people dependent on rural incomes dipped little from 74% in 1991 to 65% in 2011. The chapatti is shrinking faster than the number of mouths to feed. Six months ago, economists Ashok Gulati and Carmen Cahill published the results of a large study of India’s farm policies for ICRIER-OECD. They found among 52 major economies, Indian farmers got a negative 14% price support from government between 2000-01 and 2016-17. Thus, cultivators were taxed by depressed farm-gate prices, limited marketing, storage and credit opportunities. The effect of this far outweighed the value of any promised sops. Only Ukraine treats cultivators worse. Norwegian farmers, with 60% price support are best off; OECD cultivators get 20% support. The report reckons over 17 years, Indian farmers have been milked for Rs 45 lakh crore in implicit taxes, the highest globally. The MGNREGA basic income guarantee for 100 days every year, implemented by the previous UPA regime, set an effective floor for agricultural wages, which rose steadily for seven years. Over the last five years, the scheme got little support from the Modi regime. Farm and informal economies were shafted by demonetisation, botched Jan Dhan and crop insurance plans. So yes, India’s poor need something like MIG. Two, bean counters will fret that MIG is unaffordable. Rubbish. In fiscal 2016-17, the last year for which we have a complete account, the government gave away a staggering Rs 1,56,000 crore to businesses and well-heeled individuals under palliative headings like ‘incentives’, ‘relief’ and ‘concessions’. These include massive discounts on corporate tax, slightly smaller ones on income and other taxes and breaks on profits for entities, in say, special economic zones. These handouts to companies and well-heeled Indians actually jumped by a third from 2014-15, the first full fiscal year of the Modi administration. 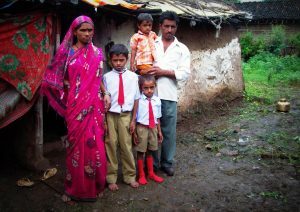 In three years, the government has doled out an average of Rs 1,50,000 crore, each year, to those who least need them. Of India’s 300 million households, 50 million participated each year in MGNREGA during its most successful years. Now imagine what could happen if India scrapped all handouts for companies and well-off folk, and diverted this to poor families. Each poor household would receive an average of Rs 30,000 every year, equal to 100 days’ worth of minimum wages, for 100 days every year. Without subtracting one paisa from existing farm or food subsidies, or pinching the government an extra rupee. Businesses might feel aggrieved. They shouldn’t: 99.94%, or 6,08,500 of 6,08,836 companies surveyed by government, get no breaks anyway. They pay maximum effective tax, around 29%. On the other hand, India’s richest 335 companies, with profits greater than Rs 500 crore, get sops and pay around 23% to the exchequer. India needs and can afford MIG. Finally, what are the chances that each poor family actually gets its Rs 30,000 each year without the hassle of queuing up, paying bribes to local bigwigs, or not getting a paisa? Any thought of transferring money into bank accounts of the poor is a pipe-dream. IMF reports India has 14 bank branches for every 1,00,000 adults, way lower than 257 in Colombia, Spain (62), Japan (34) and America (33). The average misleads. Half of these branches serve cities with just 9% of our population. The other 91% of adults, about 600 million, have 7,00,000 branches between them, 0.001 branch per lakh people. Modi administration’s Jan Dhan was supposed to create 320 million accounts for the poor. After much 56-inch paunch-thumping, these are inactive, fictitious, or vents for money-laundering. Electronic transfers and so on are tricky, the biometric Aadhaar ID system is an outsourced, graft- and error-ridden flop. Going back to the past, to old fashioned money transfers through India’s vast postal system, could be the way of the future.